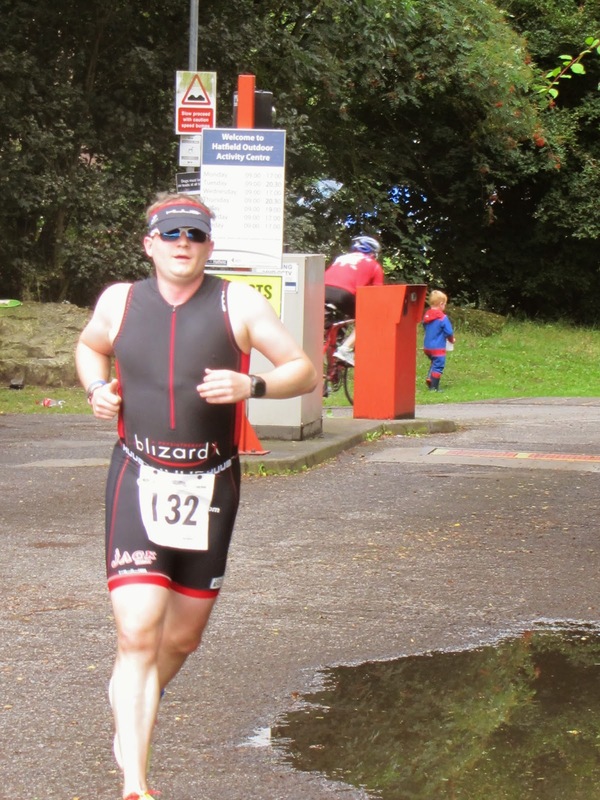 Last Sunday saw me compete in the Hatifled Triathlon for the second time. This triathlon was the same race I competed 2 years ago, the site of my first triathlon. I wanted to go into the race and set a new PB to see how much I had improved in the last two years. Given I had hardly trained (2 5km runs and 2 swim sessions) since Ironman Austria, it definitely wasn’t the best preparation. I decided to carry out an experiment in this race and race completely to HR zones. My aim was to complete the bike at a minimum HR of 160bpm (well into my tempo zone) and then back this up with a minimum HR of 170bpm (again into my tempo zone) and see if I could hold those respective efforts for the duration of the sprint distance race. Yes I knew it would hurt but after holding 180bpm in the Doncaster 5km, I thought it was a worthwhile experiment. Race day morning arrived and I made my way over to the Waterpark in Hatfield. Registration was seemless. Now time for racking. Since deciding to race sprints, I have stripped my bike down to its bare essentials. Given I punctured earlier in the season, those essentials stop at foam and CO2 cartidge. No bottles. It’s amazing how little stuff I need for a sprint. 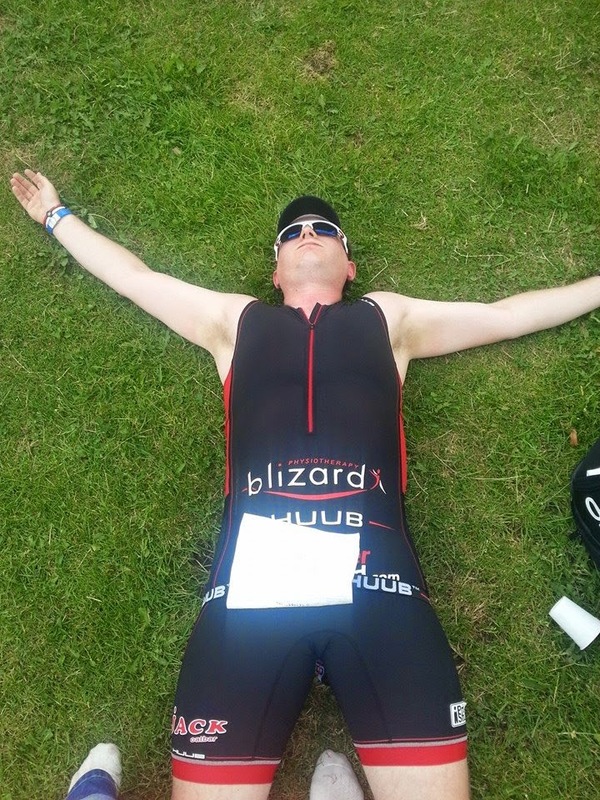 When compared to how much I took for my first triathlon, it is joyfully minimalist. My transition area held my bike (complete with shoes on), a towel, my visor and sunglasses. Compared to this photo from the same race two years ago this is nothing. The plan for the swim was to push hard but comfortably hard. I always find it hard to guage effort on swimming, I have two speeds (all out sprint) and my general swimming pace. I pushed hard from the hooter but couldn’t find a way through the swimmers in front until we made the first buoy. Then I nipped past a few swimmers and was in clear water. This continued for the last 450m. I exited in around 12 minutes and ran to transition while removing my wetsuit. It amazes me how efficient I have got at this. I had the top half of my Archimedes off before I had hit dry land. Thanks for the breakaway zipper HUUB. After reaching transition I stripped my wetsuit off and unracked #Rinnie and ran to the mount line. I hopped on and set about pedalling. Thankfully I had remembered to have my shoes undone. Time to get some pedalling done. First job get my feet in the shoes. Second job elevate my HR above 160bpm and keep it there. For some reason my gears weren’t working correctly so I couldn’t sit in my usual gear and pedal at 90+ RPM, it was either sit in a higher gear and pedal at 85RPM or sit in a lower gear and pedal at 100+RPM. Given my lack of riding I decided to settle on the 85RPM gear. Not comfortable but moreso than pedalling at 100+ for me. The bike course at Hatfield is flat with 5 hills (motorway bridges) and I rode the entire course in the big ring and only changed gear about twice. I was pleased to set an average pace of over 19mph given I hadn't ridden any bike in 3 weeks. My average HR was 164bpm and I was working that hard that I even vommed a bit in my mouth. Thats a first for me. I only got overtaken by about 10 cyclists throughout the ride, which pleased me. As I was pulling into the Waterpark I took my feet out of my shoes in preparation for a flying dismount. I flew into T2. Bike racked now for putting my trainers on and starting the run. Since I have been using talc in my trainers, my T2's have gotten a lot quicker. Time for more suffering. It took me a while to find my running legs but I managed to get my HR above 170bpm quickly in my run. Despite the run route differing from 2012. 5km is still 5km. I made it to the turn point and wasn't passed once. On the return leg, my pace seemed to slow and I was really starting to hurt. I got passed by about 10 runners in the second half of the run. This is my own fault as I have done little run training since Austria. I have lost a lot of speed and a lot of endurance. I was so relieved to make it onto the finishing field. With less than 400m to go, I decided to push harder. I really wanted to get to that line. I finished the race in 1:27:33 which was a 24 minute improvement on 2012. 24 minutes is ridiculous PB over a sprint distance and I really believe that with the right training there is still a lot more to come off that time especially as I hadn't trained properly going into the race. Who knows what my time will be in 2015 but one thing is for sure, I'll be racing to find out. Below are the stats comparing 2012 and 2014. As you can see I improved in every discipline which proves how much I have grown as a triathlete. I'm so proud of how much I have improved. And if anyone doubts how hard I worked in this race, here is the proof. A bit late. My pre IM blog.